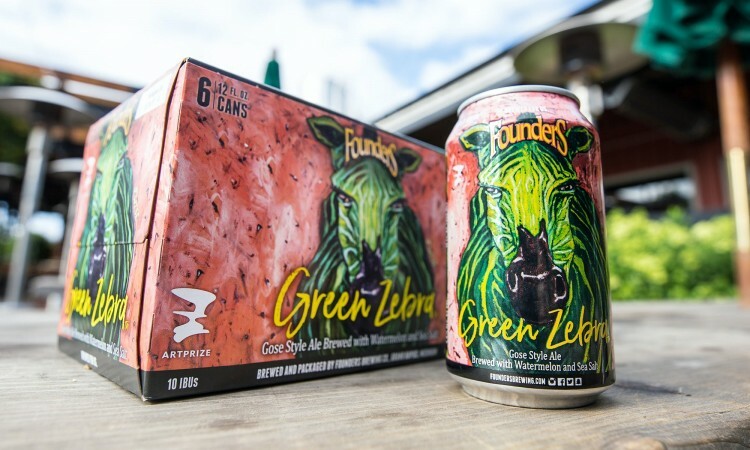 For the fifth consecutive year, ArtPrize has partnered with Founders Brewing Co. to create the Official Beer of ArtPrize Nine―Green Zebra, a gose-style ale brewed with watermelon and sea salt. Whether you’re a beer lover or not, this refreshing take on a nearly extinct German style is worth a taste. Watermelon is the highlight of this lightly-hopped treat and gives it a hint of satisfying juiciness. The soft mouthfeel and dry finish comes courtesy of the addition of sea salt, a traditional gose ingredient. Subtly sour and a little sweet, Green Zebra challenges your expectations in the best way. The gose style is fairly unique and unknown, which is why we can’t wait to share this version of the ale to a larger audience during ArtPrize Nine. Previous ArtPrize series beers include Inspired Artist, Spectra Trifecta, Mosaic Promise and Pale Joe. Brewed to benefit ArtPrize, Green Zebra will be available in 12 ounce cans/6-packs, in addition to draft, starting August 15. As you’re discovering ArtPrize Nine, be sure to stop by Founders Brewing Co., located at 235 Grandville Ave SW, or at one of their pop-ups around town to give Green Zebra a taste. And, for the first time ever, this ArtPrize series beer will be available across all 46 states in Founders’ distribution network, so even more of you can get to know this unique style and partnership.